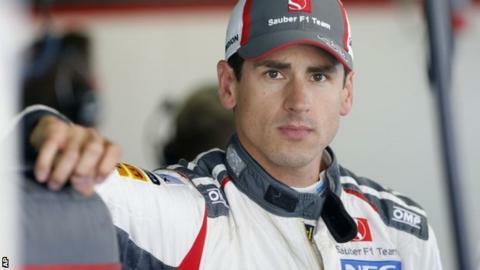 Sauber face a contract row with their driver Adrian Sutil after dropping him from the team for 2015. The German has previously said he has a contract for next season, but Sauber have announced the signing of Marcus Ericsson and Felipe Nasr. Sutil, 31, said: "They've confirmed two drivers but that doesn't mean they can drive and it doesn't mean the team's going to drive." Team boss Monisha Kaltenborn said: "I am very clearly aware of my situation." She added: "I know what I'm doing." Adrian Sutil is in his seventh season in Formula 1, with a best finish of fourth in the 2009 Italian Grand Prix. The German spent six years with Force India in its various guises before joining Sauber in 2014. He has yet to score a point, with a best finish of 11th. Sauber have been struggling financially in 2014 and both Swede Ericsson, who drove for Caterham this season, and Brazilian Nasr - Williams's reserve driver - bring substantial budgets with them, believed to be worth more than £20m. "You have to look at the overall situation in Formula 1, which is very challenging," said Kaltenborn. "When private teams make decisions they have to take financial aspects into consideration, otherwise it gets very difficult to survive. "That's the situation, but it's now different for us. This is a step in the right direction." Sutil, who joined the Swiss team this season, added: "Now, of course, my situation, I think I have to do some talking, to sort out things." Brazilian Grand Prix coverage details.